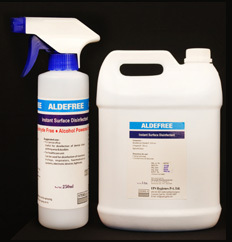 Aldefree is an isopropyl alcohol disinfectant spray free from aldehydes to be used to clean surfaces of various instruments. Now with a new improved formulation. Disinfection of surfaces of dental chairs. Surfaces of monitors, respirators, ventilators, haemodialysis systems, electronic devices, lights, trolleys etc.